My mom retired as a Principal of High school. I was really inspired by her command over the whole school and involvement with the School Board. I was so inspired and motivated by her achievements in teaching that I always wanted to be a teacher. I had a special interest in science and was very close with my science teachers. I used to participate in science fairs and even won a few prizes along the way. Summer research at Caltech is a dream come true. During my Masters in Physics, my Physics professor was the only female professor in the Science Department. That made quite a bit of an impression on me and led me to pursue a career in Physics. So I completed my Masters in Physics and Education and started on the journey as a Physics teacher in a high school in India. Along the way, I helped many students to get a quality education in Physics and Mathematics and got them prepared for admissions to many esteemed colleges, such as the Indian Institute of Technology (IIT). But destiny had a different path lined up for me. I married my best friend’s brother who happened to be working here in Pasadena, half a world away from where I grew up. So, we decided to live here and explore the beautiful Southern California. I worked on getting my CBEST and California teaching credentials and continued on with my teaching career in Physics. Since I started teaching, my mother and my husband have been motivating me to pursue further research in Physics and I have known in the back of my mind that I really wanted to do it, but with the responsibility of my young kids… So, when I was invited this summer to join the IQIM research program at Caltech I was thrilled to become a part of it! Not only has this opportunity brought me back into research, but at the same time I am excited about the fact that my students will greatly benefit from it. I have already noticed in my three years at Blair IB magnet high school that many girls have taken up the IB Physics course with me, a female teacher. I am sure as a result many of the students, not just girls, will be inspired to pursue Physics even further, in esteemed places such as Caltech. I got a chance to work in Prof. Adhikari’s lab where some of the LIGO group members had built an optical set-up that allows for precision measurements of the mechanical loss, or mechanical Quality, of various optical materials. 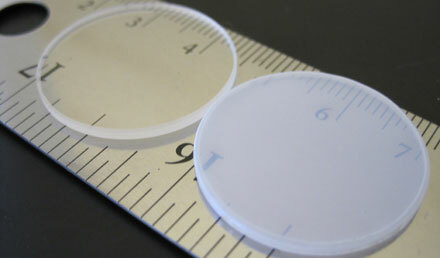 They measured quality factors of coated and uncoated fused silica disks like the ones in the picture below. Coated and uncoated silica disks. It was an amazing experience for me to work with my mentor Matt Abernathy, who is a postdoctoral researcher at Caltech. We rebuilt the apparatus originally built by undergraduate Giordon Stark, graduate student Zach Korth, and postdoc Alastair Heptonstall. I used the resonant mode frequencies calculated using finite element modeling, along with manual and electromagnetic (EM) excitation, to find the resonant mechanical modes of the disks. Once we found the modes, we could excite them using the EM excitation and record the ring-downs. In EM excitation, the substrate is excited by using an electrostatic drive which has a High DC Voltage to induce charge on the disc, and an AC Voltage to excite the disk at its resonant frequency. Once the resonant mode is excited, we turn off the EM excitation and record the motion of the silica disk as it rings down. How long this takes is related to its mechanical loss, or mechanical Quality factor. Another exciting thing that I did was Finite Element Modeling (FEM) using a program called COMSOL Multiphysics. COMSOL has several problem-solving benefits. When starting a new project, using COMSOL helps you understand the problem better. You can use COMSOL and other FEM programs to simulate your experiment so that you can see what you expect to happen. You can also use the model to get important details from your experiment that you may not be able to measure directly. I was just learning to use COMSOL, by following the COMSOL tutorial; I made a Busbar model and a wrench. In the future, the group hopes to use a COMSOL model of the silica disks to gather more information about the mechanical loss in the coatings. While I gained a lot of exciting new knowledge on the nature of waves and gravitational physics, my work with Matt reinforced my feeling of how great it is to teach and to spread the excitement of science to the public. I can’t wait for the Fall to share my lab experience with my students, telling them all about gravitational waves, their sources, their place in nature and the ambitious endeavor of detecting them with LIGO. I would really like my students to visit the LIGO lab and get to see the actual setup and meet the young scientists working on such a grand project. It would inspire them to dream big. 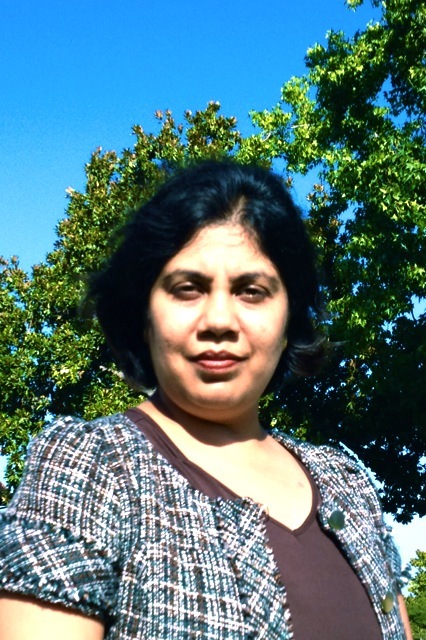 Editor’s note: Monika Batra has been teaching IB Physics at Blair IB Magnet High School. She has a Masters in Physics and Education. Like Mr. Fackrell (“How I learned to stop worrying and love graphene”), Mrs. Walsh (“Superconductors in the Summer”) and Mr. Maloney (“Much more than Lasers and Mirrors”), she was part of IQIM’s Summer Research Institute, a six-week program designed to expose local physics teachers and high-school students to cutting-edge research taking place at Caltech’s research labs. Mrs. Batra worked at the Adhikari Lab under the supervision of postdoctoral scholar, Matthew Abernathy. This entry was posted in Real science by monikabatrablog. Bookmark the permalink. Awesome work Monika! Even more awesome that you are doing what you LOVE! Not many people get that opportunity. SPREAD THE CHEER!